ANSI B16.28 equal tee is the branch diameter of this tee same with the main pipe diameter of this tee.The ANSI B16.28 tee is widely used as pipe fittings to connect pipelines with a pipe at a right angle,and is extensively used in pipeline networks to transport two-phase fluid mixtures.ANSI B16.28 tee is made of various materials,various sizes and finishes. In Hebei Haihao,we mainly manufacture tee according to standards:ANSI/ASME B16.28,ANSI/ASME B16.9,ASME/ANSI B16.11,MSS SP-75,MSS SP-43,BS EN 10253,DIN2605,2609,2615,2616,2617,,DIN28011,GOST 17375,17376,17378,17379,17380,30753,JIS B2311,JIS B2312,JIS B2313,JIST B2316,ISO 3419,ISO 5251,etc. 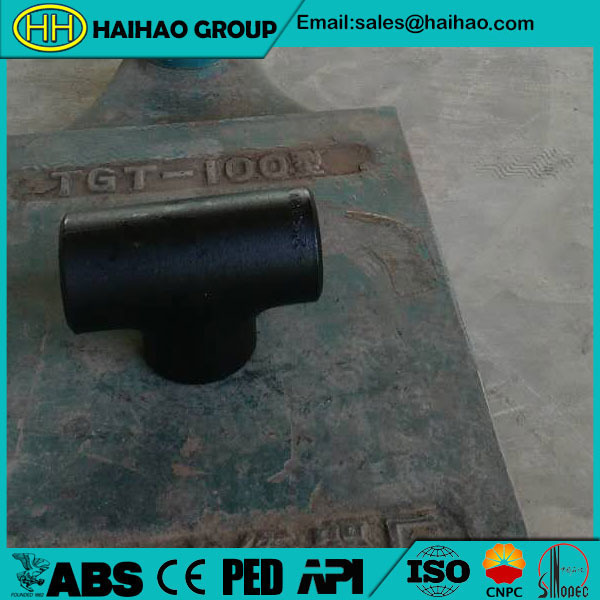 We can produce different size according to customers’ any requirements.The size of the ANSI B16.28 tee size are:1/2”-72” or DN15-DN1800.We usually produce ANSI B16.28 tee size is 3inch. The ANSI B16.28 tee schedule are:SCH20,SCH30,STD,SCH40,SCH60,XS,SCH80,SCH100,etc. We as a first class manufacturer of ANSI B16.28 tee.We professional make ANSI B16.28 tee brand for many years.We have our own team and advanced technology to produce.If you have any requirements about the ANSI B16.28 tee or other types of products,welcome tocontact us.